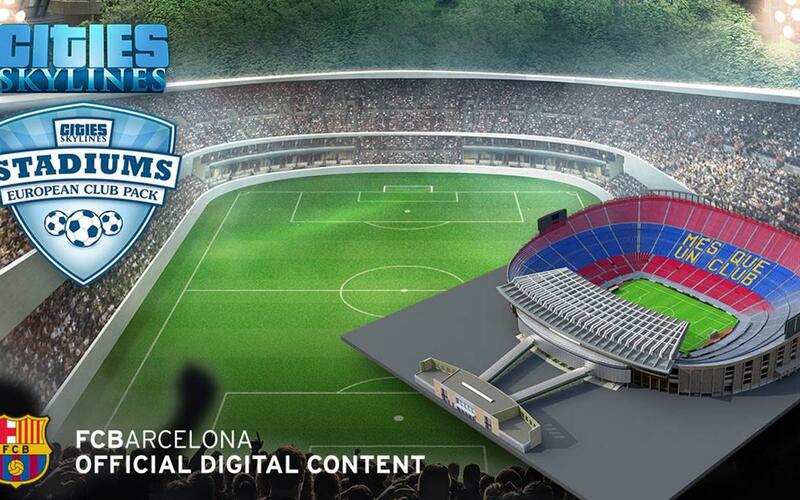 Game players can now add Camp Nou to their virtual worlds thanks to a new add-on, “Stadiums: European Club Pack”, to the popular city-buliding game Cities:Skylines. The publisher of goal-orientated games, Paradox Interactive, launches today the European Club Pack in which stadiums can play host to players’ favorite real-life football clubs, taking on the appearance of their home stadiums from the real world. FC Barcelona is joined in the game by other leading clubs Chelsea, Juventus and Paris Saint-Germain. The European Club Pack works in concert with the free “Match Day” expansion which was released for free in June 2016, which allows players to build massive sports venues into their cities and reap added revenue while handling the new challenges of game-day traffic. Now, in-game crowds can flock to see their favorite football clubs in action and enjoy a day at the arena in style. Players can pick up the European Club Pack today at https://www.paradoxplaza.com/cities-skylines-stadiums-european-club-pack/.